Tyler Johnson’s trophy case is looking a bit fuller these days. 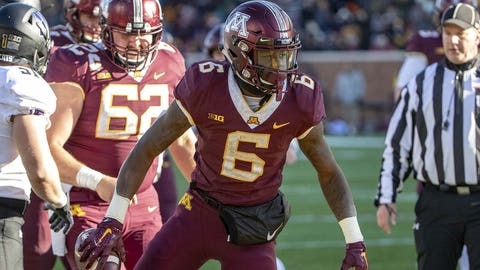 Just a few days after his 76 receiving yards helped the Gophers take home Paul Bunyan’s Axe for the first time since 2003, the junior was named to the All-Big Ten first team by the media Wednesday evening. Johnson was named to the second team by coaches. The Minneapolis native finished second in the conference with 1,112 receiving yards, just 52 shy of Purdue’s Rondale Moore, who was named the receiver of the year. Johnson was one of three Big Ten receivers to score at least 10 touchdowns. His 1,112 yards rank second in Gophers history behind Ron Johnson’s 1,125 set in 2000. The last Gophers player to be named to the All-Big Ten team was offensive lineman Zac Epping in 2014, and Johnson is the first Minnesota receiver since Eric Decker in 2009. Freshman running back Mohamed Ibrahim and five offensive linemen — Blaise Andries, Daniel Faalele, Donnell Greene, Conner Olson and Jared Weyler — earned an All-Big Ten honorable mention nod by the media, while Greene got the lone nod from the coaches.